So first of all, there’s parking. You have to pay $6 to park at the parking structures. We parked at the one closest to the restaurant. We almost missed a good parking spot, so we made a 3 point, oh wait, 5 point turn to back into the spot. Which pissed off some lady in a van waiting behind us. It didn’t take us that long, but apparently, long enough for her to drive in front of us slowly, mad-dogging us, as we mad-dogged her back. I don’t know what her problem was… hehe. When we got there, it looked pretty empty. But that didn’t stop us from trying this place out! Besides, we got there before 4pm and most people don’t eat that early for dinner anyway. It had a really nice vibe with red walls and cute decor of their naga naga mascot, some dude with spiky hair engulfed in noodles. There was also a really big fish tank. There were a lot of choices on the menu. You can order different soup bases, such as tonkotsu, shoyu, and miso. 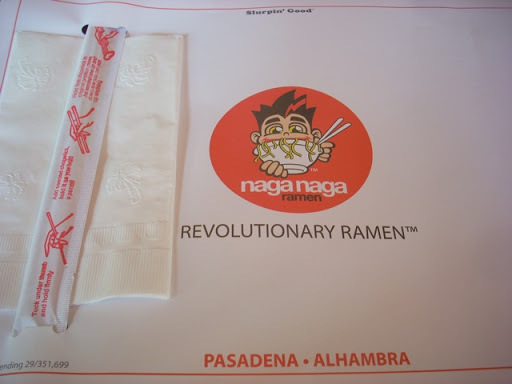 They also serve udon, cold noodle, pan friend noodles, and what they call revolutionary ramen (non traditional flavored ramen.) 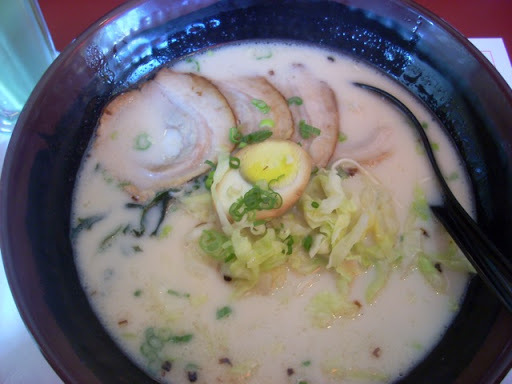 I ordered the traditional tonkotsu ramen, which they call naga naga ramen, with pork, cabbage, seaweed and egg. I had the bamboo removed cuz I don’t like bamboot. I also requested for the straight noodle. 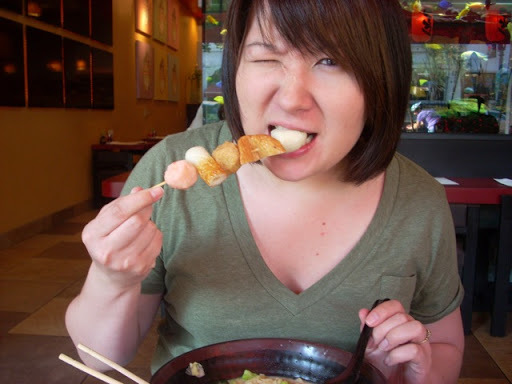 Tanya ordered the tonkotsu oden ramen. Oh dang! Hahaha. Sorry, Korean joke from Tanya. 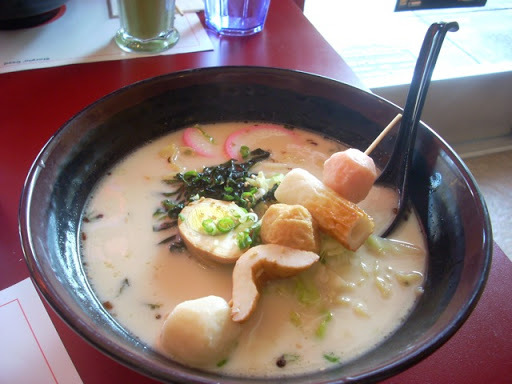 Oden is fish cake, which this ramen had assorted oden, also with cabbage, seaweed and egg, with curly noodles. 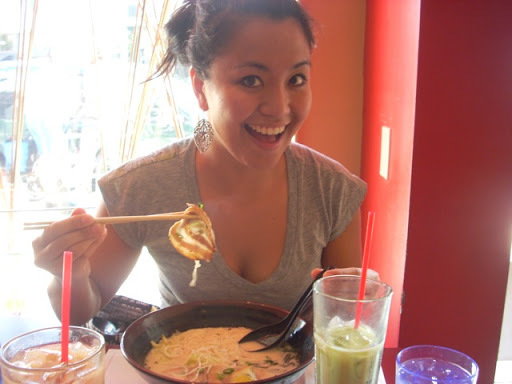 I really liked the ramen, from the broth to the noodles to even the ODEEEEN! The oden was perfect! Some of them were sweet and others just full of flavor goodness! Made me miss the street vendors in South Korea. KOREEEAAAA I MISS YOU! hehe. To my surprise, there was cabbage in the soup and it made an awesome garnish. I don’t have any complaints from the service to the food or the place. It’s somewhere I would love to visit again, and the prices were really decent. I enjoyed everything, can’t you tell? hahaha. I have to agree with Tanya, this place was pretty damn good. I always see the restaurant but never bothered going in because I always hear about Daikokuya and other places. But I was really surprised of how good this place was. The broth was yummy, the noodles were bomb, the pork was nice and tender and not too fatty, and I thought I wouldn’t like the cabbage, but it really gave it a nice touch. I work in the area and will definitely check this out again. I love Pasadena, it’s a really chill area with cool shops, restaurants and clubs. Kind of like L.A. but not as crazy. But you get to see interesting things once in a while. On our way back to the car, we saw a dirty old bum, listening to his iPod. Anyway, I felt a little swollen after we ate. 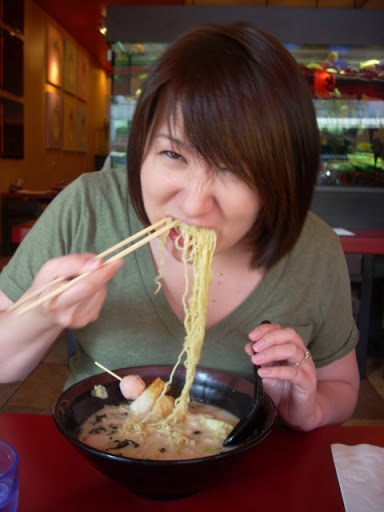 Tanya says that sodium can cause swelling so take that into consideration when eating ramen. Which is also why we don’t go that often anyway. And that’s why we’re at my house, washing it down with lots of tea. We plan on ramen runs every 3 or 4 weeks. 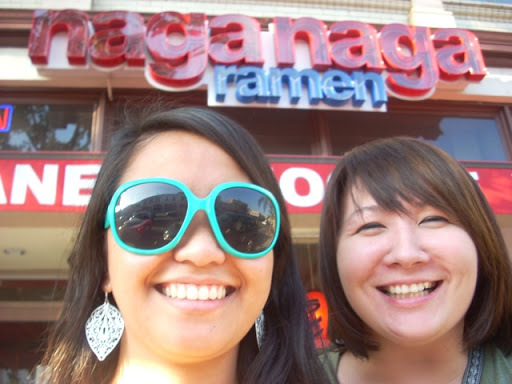 So until then, thanks for reading and we’ll see you again on our next ramen run!